Although So Kong Dong isn’t in NYC, I make a visit to my hometown at least once a month to devour its unparalleled tofu. Its phone number is programmed into my phone. I’ve brought carry-out back to NYC at the request of desperate friends. Hey, if Anthony Bourdain visited this place on his No Reservations: New Jersey episode, it’s gotta be pretty good, right? 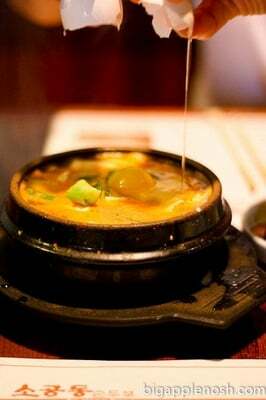 A high school friend first introduced me to Korean tofu, aka sundubu jjigae, more than 10 years ago. I admit, back then I was not as adventurous with my food as I am now. It took a little convincing for me to try it – after all, “soft tofu soup”? It wasn’t an easy sell. I’m sure glad I took that leap of faith; sundubu has since become my comfort food of choice. Of course a Korean meal can’t start without the requisite ban chan – in this case, nabak kimchi, kimchi, kongnamul (seasoned bean sprouts, my absolute fave! ), kkakdugi and oyee (cucumber) kimchi. Not the most extensive spread, but I don’t dine here for the ban chan so it’s okay. 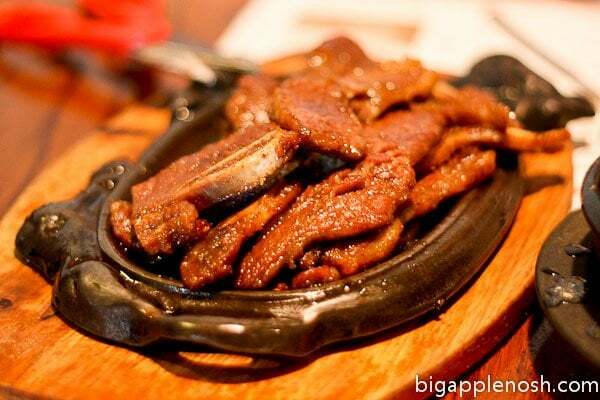 Food falls into two categories here – tofu, with various mix-ins, and galbi short ribs. Mix-ins include mushrooms, beef, pork, clams, a general “seafood” category and whatever else your Korean-food heart desires. 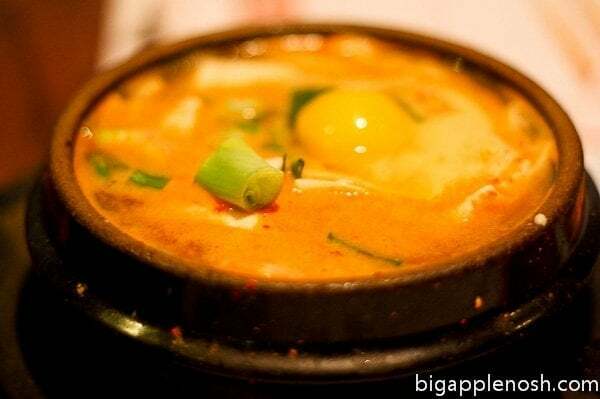 To add another level of complexity, you need to order a level of spiciness for your sundubu. I usually go for the seafood beef combo, with a not-too-spicy level of heat (I’m a wimp). Oh and an order of galbi (I’m a pig). You also get a hulking bowl of rice with your order. 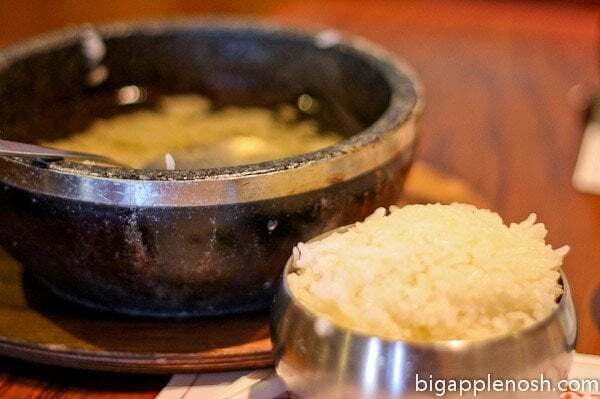 This isn’t just any rice – although it is pretty typical of Korean restaurants. It is soft, dense, and a perfect counterpoint to your sundubu and ribs. The egg will soft-boil in the steaming hot soup. Stir up the jjigae and dig in, yep – it’s that simple. It’s savory, full of umami, very barely briny and filling. It’s a huge bowl, but I’ve never had problems finishing it. Mmmmm. Of course you can’t forget about the galbi. In true authentic style, it is served with a pair of scissors, for maximum cutting ease. And let’s not talk about the irony of serving beef ribs in a cow-shaped dish. I get it. And it still cracks me up after 12 years. I’ve been to multiple sundubu restaurants in NYC; however, my heart will always belong to So Kong Dong. At $10 for a sundubu and $18 for galbi, it’s a reasonable indulgence. Run, don’t walk, to your nearest zipcar account and make the trip to NJ. You won’t regret it. i've SO been there (unless there's more than one sundubu place on that road)! and oh my god it was delicious. This is definitely going to go on my must visit list when I hit NY. I miss GOOD Korean food. We have found some decent places in NC but nothing like Cali so far. so I am definitely going to give this a try. Looks so great! 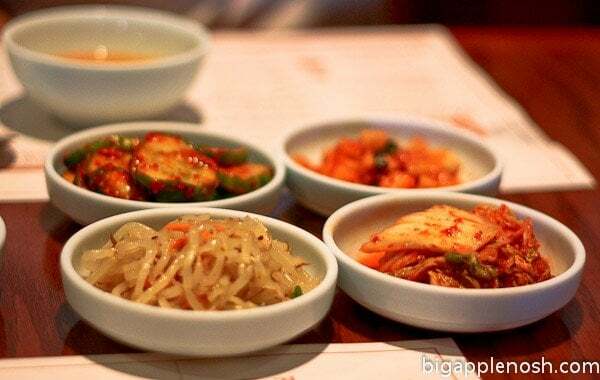 There is not really any good Korean food here in Berkeley (although neighboring Oakland has a few decent places) and I am ALWAYS craving Korean! Korean food!! YAY!! I wish I had a car so I could drive over there. Everything looks great! Yummy memories! Would love to go back for some more soft tofu! so good. sooooo good. when can i have more? I'm fascinated by this whole breaking an egg at the table deal. I would def. need a guide to tell me what to do and when! Looks awesome!! I still need to try more Korean food…I've only had it once and I'm married to a Korean! OMG drooooool. I love Korean food. mmm this place looks and sounds delicious!! i love clay cooked meals with a raw egg on top or mixed in, yum!! AHH i LOVE so kong dong!! i must go to NJ now! it's a tough call in my mind, but a lot of people think the place by the same name in Palisades Park, NJ is even better. plus, it's way easier to get a table in Pal Park, so that helps, and then you can stop by Hmart too! I love Korean Food. LOVE it. And Love you for posting pretty pics of Korean Food. I'm going to a 100 day party tomorrow for a little boy I know and they best have me some rice cake and korean bbq waiting.